← That’s Marvel BadAss! – Week Four! I had a fun day of family, food and comics for Christmas today. But, my celebration started a few weeks ago, when I popped down to Heroes Aren’t Hard to Find for a holiday sale. And, to what did my wondering eyes then appear? 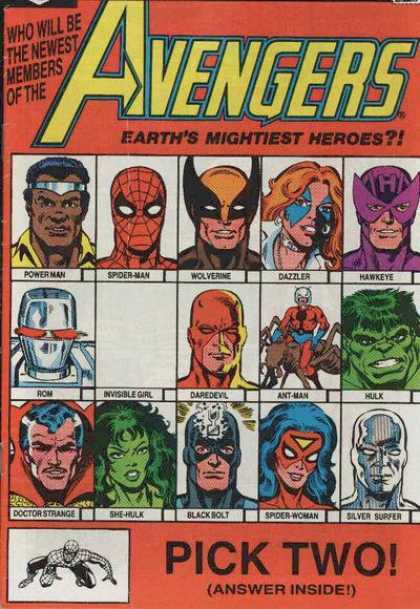 $1 boxes galore and some real treats … among them West Coast Avengers #1 -4. – Hawkeye – The American Dream — a “Horatio Alger” hero who pulled himself up by his seven-league bootstraps from less than modest beginnings to stand with the world’s greatest heroes. – Puck – Representing Canada (Eh?) and the mutant population. – Red Wolf – The bastion of Native American heroism. – Rom, Spaceknight – Illegal alien. (Come on, you know he didn’t fill out any paperwork.) He earned it. He was teased as a potential Avenger TWICE! I know I have an affinity for D-List characters and this series would only sell, like six copies (at least three of which would have gone to me, @mockingnerd and @JimMcCann), but I would have loved to see it. This entry was posted in Comic Book Humor, Comic Books, Marvel Comics and tagged Comics, Hawkeye, Marvel, Puck, Red Wolf, Rom, Thundra, West Coast Avengers. Bookmark the permalink.